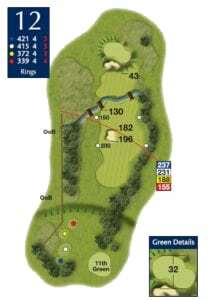 A downhill Tee shot on this par 5 gives you a choice for your second; attack the green and take on two large fairway bunkers or lay up and have a short iron to a narrow green. A long par 3 cut in to the highest part of the Golf course. 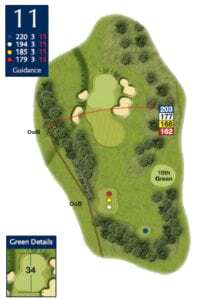 A shot up the left can be rewarded with a “members bounce” on to the green. 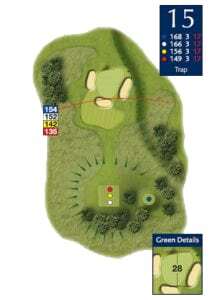 A par 3 is always a good score. A raised tee gives stunning views of the golf course on this excellent par 4. A well positioned tee shot short of the ditch leaves a mid iron over a large greenside bunker. An accurate tee shot is required on this slight right to left doglegged par 4. A lake next to the green awaits any wayward shots that come up short and right. 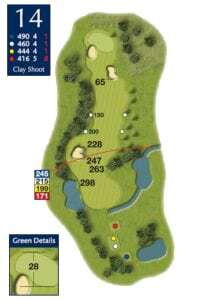 The longest Par 4 on the course. An accurate tee shot is required through a gap between trees right and a bunker left leaving a long uphill approach to the green. A stunning downhill par protected by 3 large bunkers. Good shots are always rewarded with great birdie opportunities. 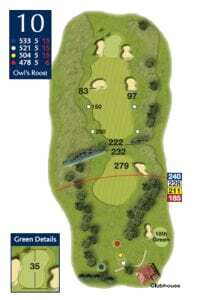 One of the best “Risk and Reward” holes you will play; the more aggressive the tee shot, the easier the approach. 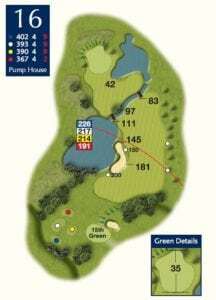 You may elect to play around the lake leaving an medium iron over a ditch and another lake to the safety of the green. An accurate tee shot is required as water is in play up the left hand side. A second shot over the hill leaves a short iron to this sloping green. The bigger hitters will attack this in two shots. A good birdie opportunity. A long tee shot is required to clear a valley and reach the fairway on the dog leg right 18th. 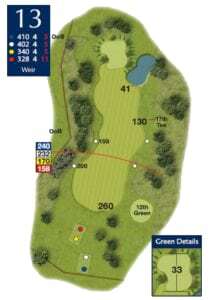 A mid iron up the hill to a two tiered sloping green will reward the good shot but punish the wayward. A great finishing hole!